Take I-26 West to exit 9, Hwy 19E toward Burnsville for 18 miles. In Burnsville turn LEFT on Hwy 197N for 12 miles. to Beech Creek entrance on LEFT. 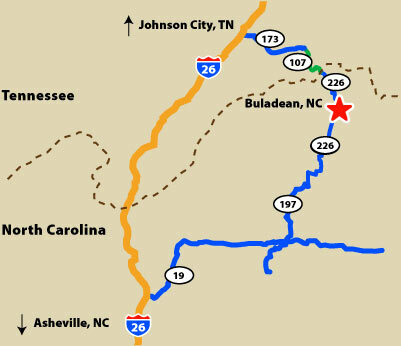 Take Exit 32, Unicoi Rd, TN-173. Turn LEFT onto TN-107 / TN-173. Continue to follow TN-107 / NC-226 for about 12 miles. Beech Creek will be on the RIGHT.